In 1985, an artifact made from volcanic rock was unearthed at the Allan O. Kelly Archaeological Dig overlooking the Agua Hedionda Lagoon in Carlsbad, California in San Diego County. Archaeologists noticed a 2.5" long by 1.5" piece of meta-volcanic rock that looked a lot like a bear. It was fashioned by California Indians around 7,000 to 8,000 years ago. Created in the way that they made arrowheads or spear points, the stone artifact displayed markings of being chipped into a specific form. The unique shape gave speculation that the small item might have had some religious connotations to the local members of the Luiseño and Juaneño Indian Tribes. This prehistoric artifact is called the “Chipped Stone Bear" and is the Official California State Prehistoric Artifact, as adopted by the California Legislature on June 24, 1991. As an effigy in prehistoric times, it is still revered today as one of the earliest examples of representational art recovered in the Western United States. The Cultural Resources Management program of State Parks funded the dig at the Carlsbad archaeological site under the direction of Dr. Henry Koerper of Cypress College, with college students engaged in the field and laboratory work. It was a Cypress College student named Richard Cerrito that discovered the artifact about two feet below ground. After the Carlsbad archeological project was completed, Dr. Koerper and his students approached a California legislative analyst with the simple idea of establishing the “Chipped Stone Bear” as the official state symbol to represent California’s Prehistory. 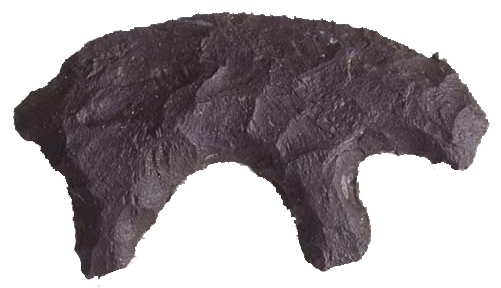 The artifact seems an ideal candidate for the official State Prehistoric Artifact, as the bear was a component of many of the California Indians’ belief systems and ceremonial practices. Moreover, the bear has representation on the California Flag, the Great Seal of the State of California, and is the official California State Animal. The legislation, Senate Bill No. 404 (SB 404), was crafted by California State Senator Ralph Dills, and introduced in the Senate on February 19, 1991. Senate Bill 404 received support from anthropologists, archeologists, members of the California Indian community, and the co-founder of the National Farm Workers Association (later: United Farm Workers) and labor leader Cesar Chavez. Dr. Koerper of Cypress College and Dr. Paul Apodaca of Chapman University, testified in favor of the proposal in legislative committee hearings. Early in June 1991, SB 404 was approved by the California Legislature. On June 24, 1991, then Governor Pete Wilson signed SB 404 declaring the Chipped Stone Bear (bear-shaped eccentric) as the official California State Prehistoric Artifact. Read SB 404 as Chaptered Law At a ceremony in the Governor's office, Dr. Henry Koerper and Dr. Jonathan Erikson, of the University of California, Irvine, presented the actual “Chipped Stone Bear” to First Lady Gayle Wilson. The Cultural Resources Division of the California Department of Parks and Recreation is the custodian of this priceless prehistoric artifact.